• Double decker sightseeing tour featuring unlimited hop-on hop-off access on Downtown, Uptown, Brooklyn and the Bronx loops. FREE Night Tour, CitySightseeing New York® Hop-on, Hop-off Ferry Tour, entrance to the Museum of the City of New York or New York Historical Society, AND an Eat and Play Discount Card. Shopping and sightseeing are prioritized in this all-inclusive NYC tour package! Enjoy 48 hours of hop-on hop-off access on 4 distinct bus routes through Manhattan, Brooklyn and the Bronx, plus a full day of shopping at the premium outlets just an hour outside the city. Your sightseeing tour is fully narrated, so you’ll get the backstories on top attractions as you see them. Spectacular views of world-renowned landmarks are everywhere you look: the Empire State Building, Times Square, Rockefeller Center, Lincoln Center, the Brooklyn Bridge, and much more! Most importantly, this tour is completely customizable – hop off at any of the 40+ convenient stops throughout NYC to explore attractions up close, at your own pace. Whether it’s people watching in Central Park, museum-hopping on Museum Mile or walking across the Brooklyn Bridge that strikes your fancy, just hop back on the next bus to continue your tour. Buses run every 20-30 minutes, so you’ll be on your way in no time! NYC is the fashion capital of the world, but the Manhattan price tags are hard to handle! That’s why we’ve added the Woodbury Common Premium Outlet tour to this package. 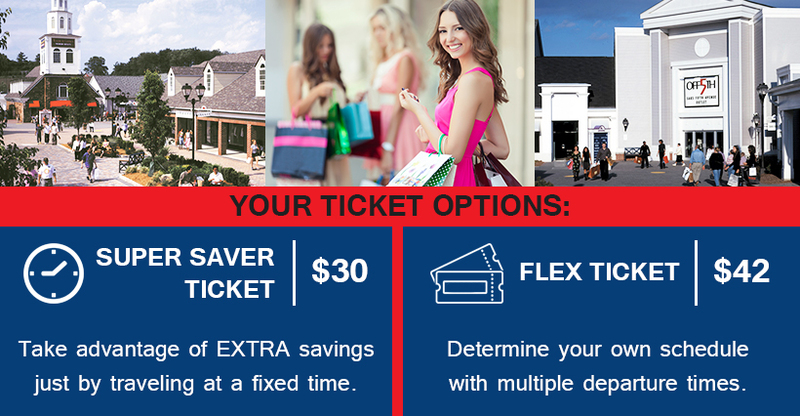 You’ll have a full day to enjoy luxury shopping at a fraction of the price. You’ll discover deals on designer clothes, accessories and specialty goods at 220+ shops in the complex! From Adidas to Armani, you’ll find everything you want for yourself and everyone else on your list. When you’re all shopped out, relax on the bus back to Manhattan while revelling in the deals you found. • See dozens of top landmarks including the Empire State Building and the Statue of Liberty!